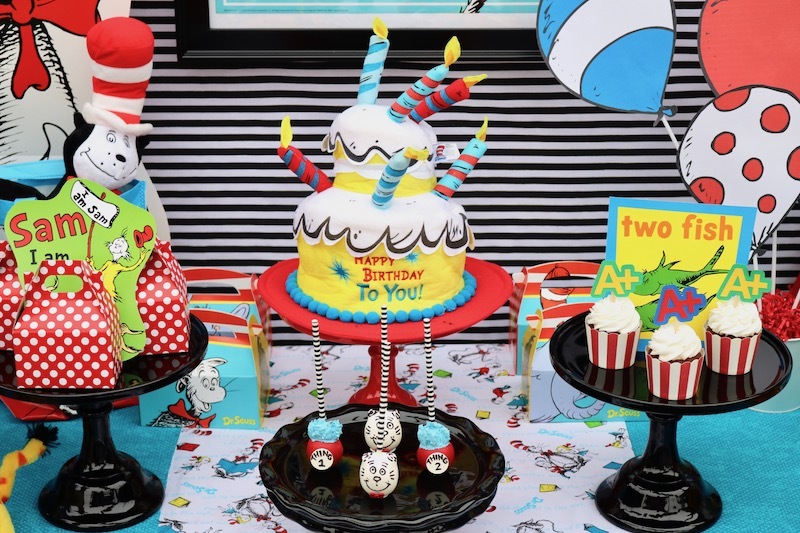 Last year I created this fun and colorful Dr. Seuss party to help kick off Read Across America week. It is also a great way to celebrate and get the children ready to head back to school! 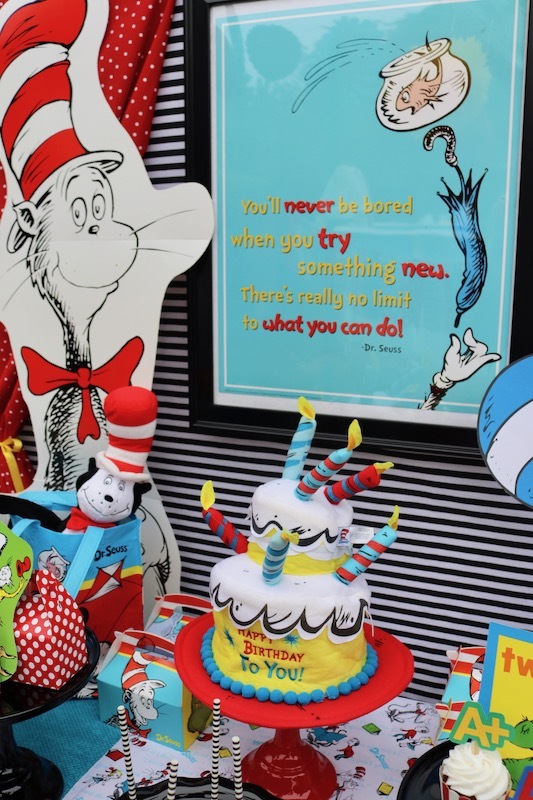 Sit and stay for a bit as we share some of our favorite Dr. Seuss books, fabulous party treats, fun party decor and lots of colorful inspiration! I remember growing up with some wonderfully whimsical Dr. Seuss stories! Some of my favorite titles as a child included: Wacky Wednesday, In a People House, I Can Read With My Eyes Shut, and of course, my very first Dr. Seuss book, Hop On Pop! Four children later, and these stories still remain a constant inspiration of silliness and creativity in our house. 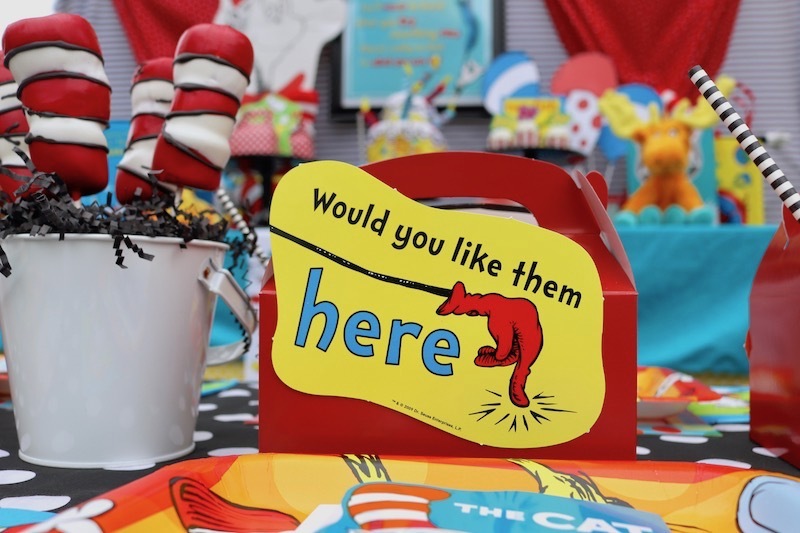 We received some super fun Dr. Seuss products from our friends over at Oriental Trading. 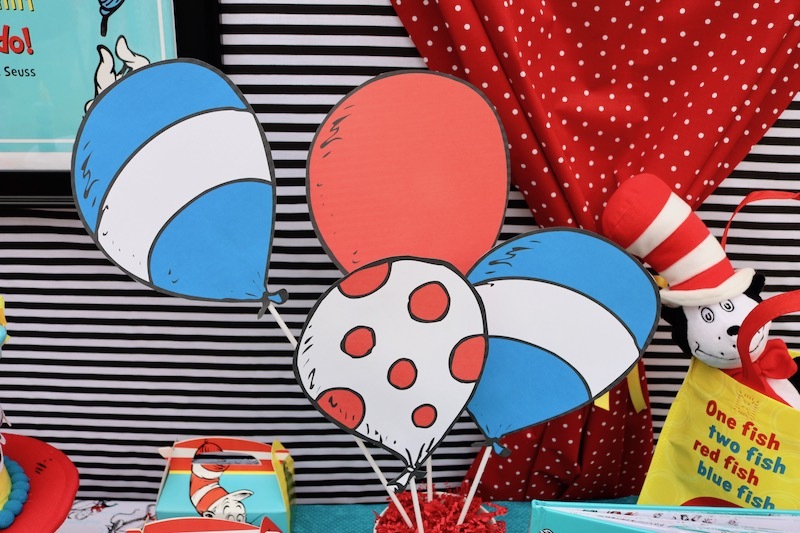 With the help of their Dr. Seuss poster, and Cat in the Hat bulletin board set I was able to create a festive Dr. Seuss themed party backdrop! You can create your own colorful creation by using fabrics in bright colors and bold patterns. 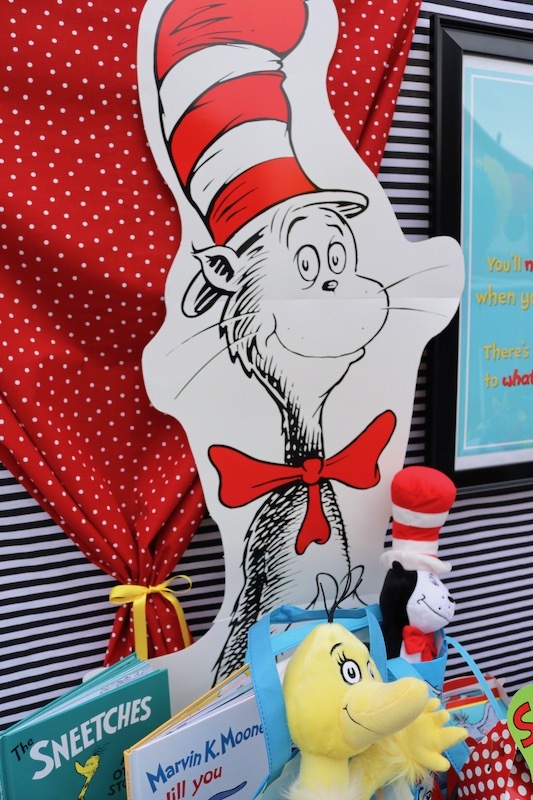 I used striped fabric for my backdrop and added a frame to the Dr. Seuss poster. 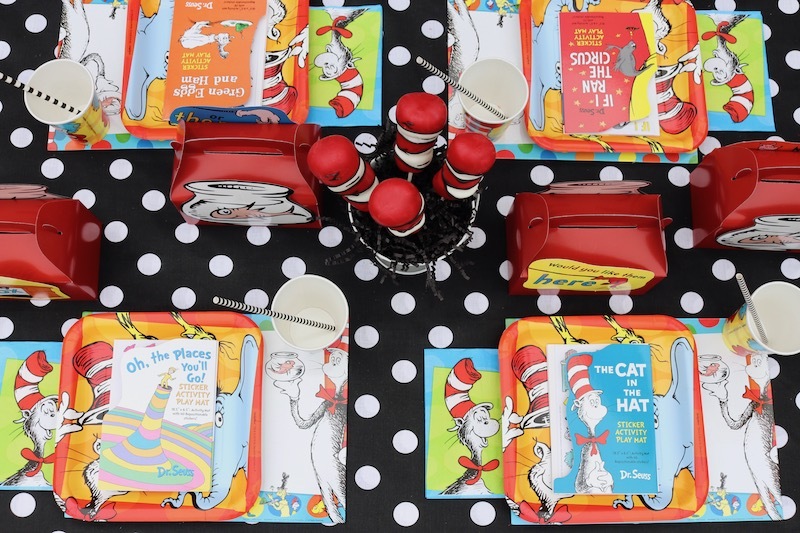 Create drapes, like in the window from the Cat in the Hat story, by using a bold colored fabric. I really enjoy mixing different patterns and colors together! Tie your drapes back with a brightly colored ribbon. 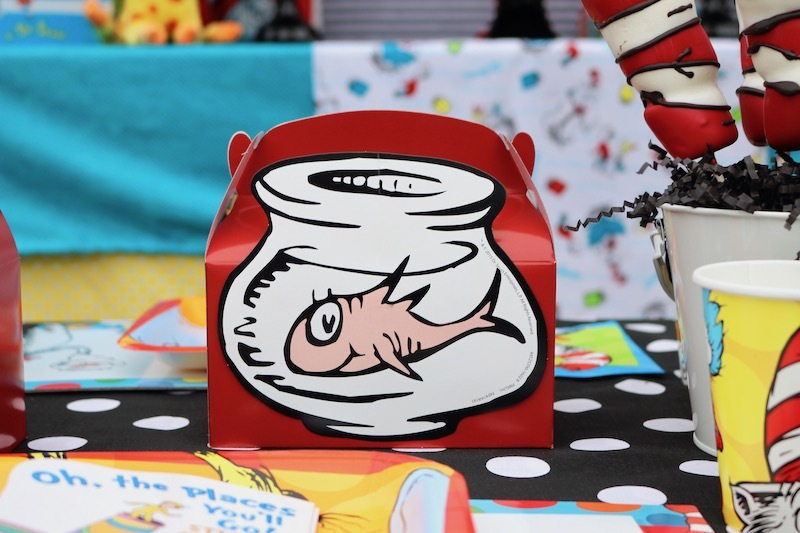 I found this darling Dr. Seuss centerpiece that was created by our friend Paula Biggs, for The Frog Prince Paperie. 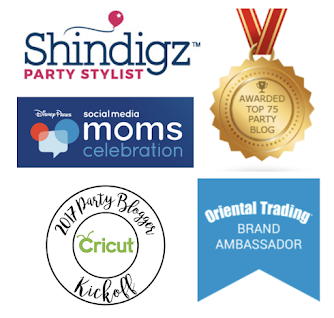 It was so easy to put together and brought such a fun element to our party table! 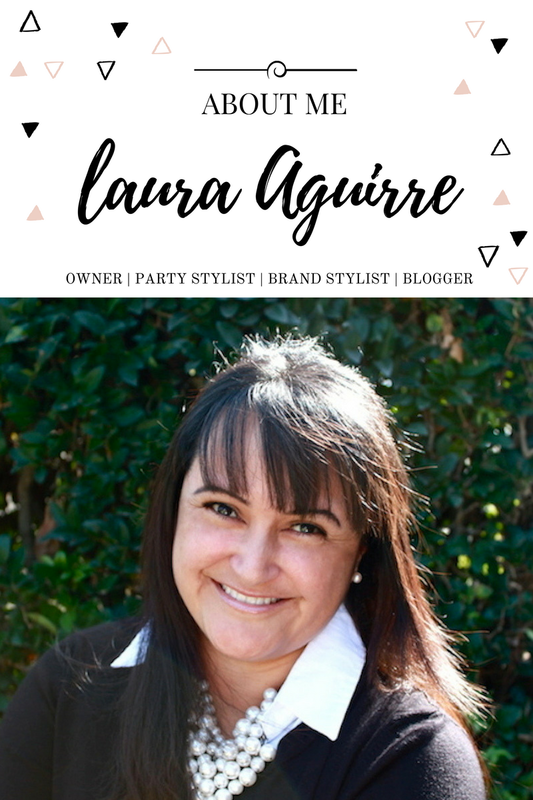 You can download her file, print, cut, and display. 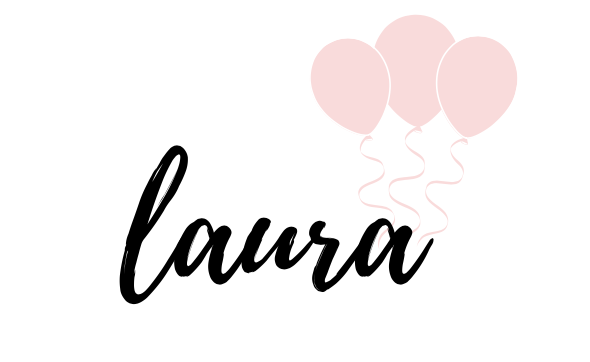 Need ideas for party favors? 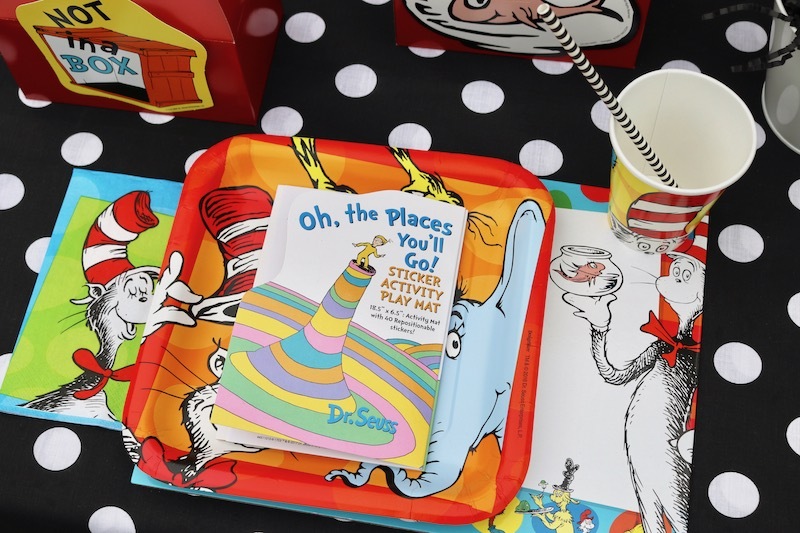 How about gifting your guests with a Dr. Seuss book and a matching plush toy?! Not only are you sending them home with a cool parting gift, you're also adding years of enjoyment to their home library! 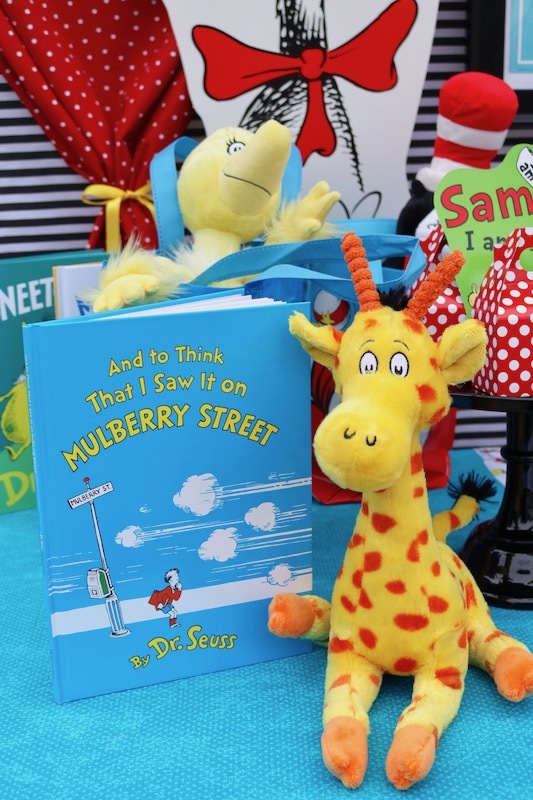 I picked up some great Dr. Seuss titles, along with a coordinating plush, from Kohl's. 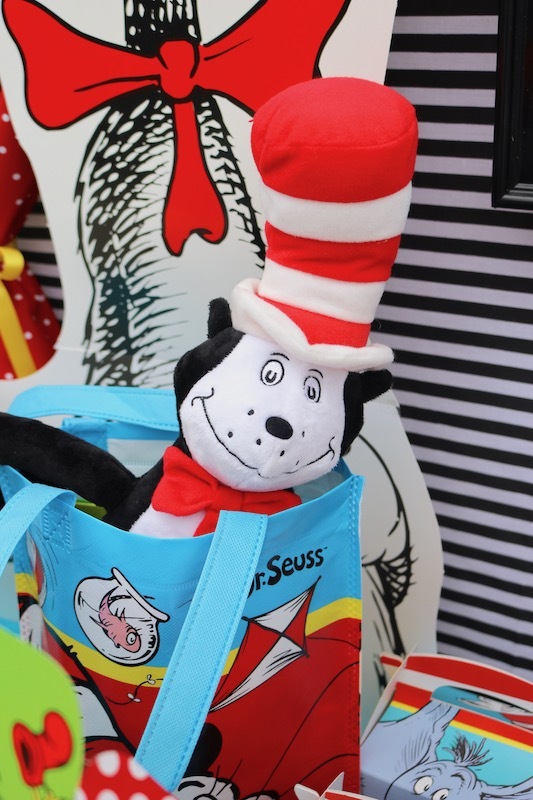 Display the books and plush toys inside a Dr. Seuss themed bag, and your guests are set! 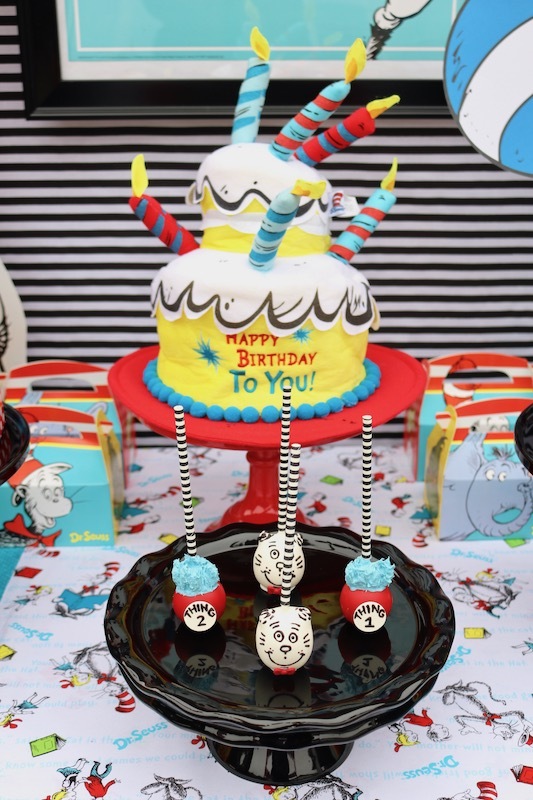 No Dr. Seuss celebration would be complete without a cake! 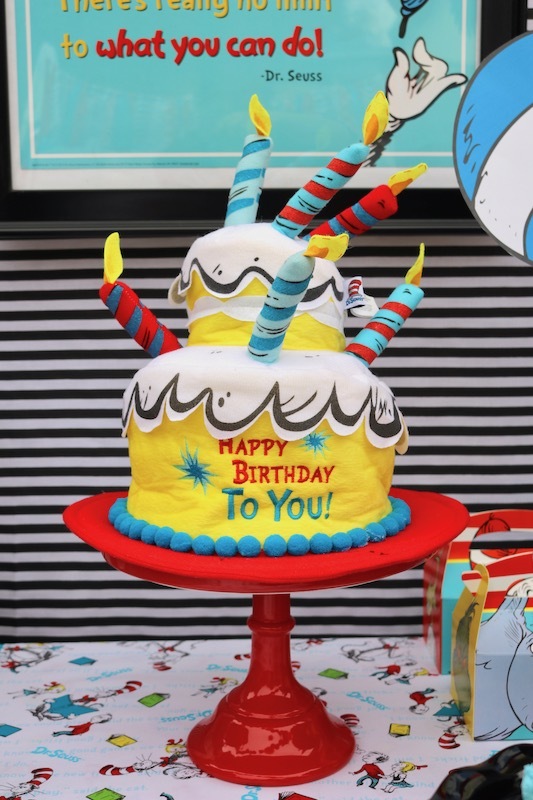 Get a little zany and use a silly birthday cake shaped hat, from Party City - display it on a cake stand and you've got yourself a pretty fun "birthday cake"! 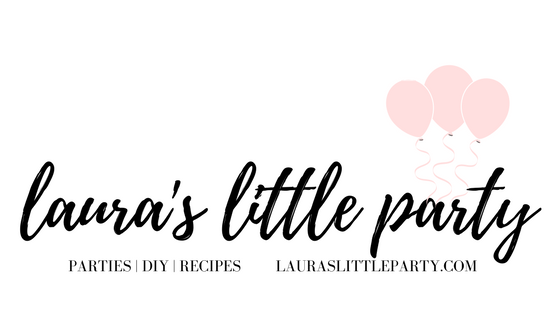 Set out some other party treats for your guests to enjoy! Cupcakes are an easy alternative. 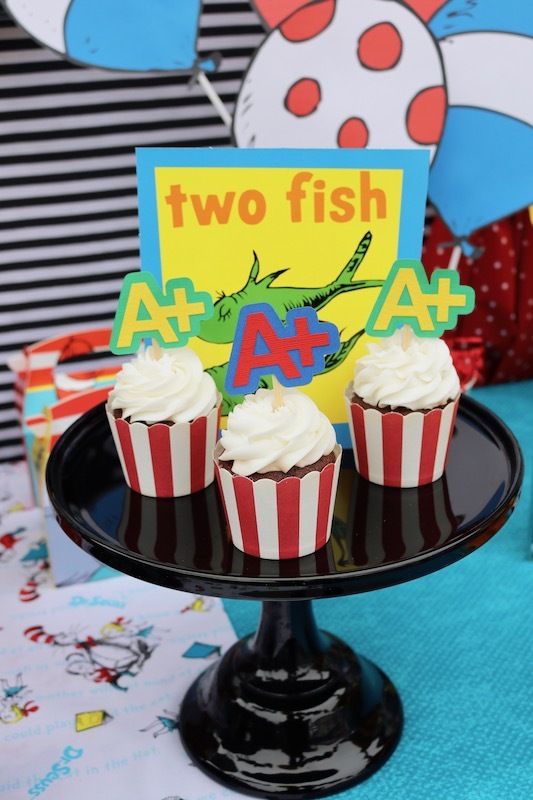 I took some brightly colored school themed cupcake toppers, from Creativities Galore, and added them to some store bought cupcakes. 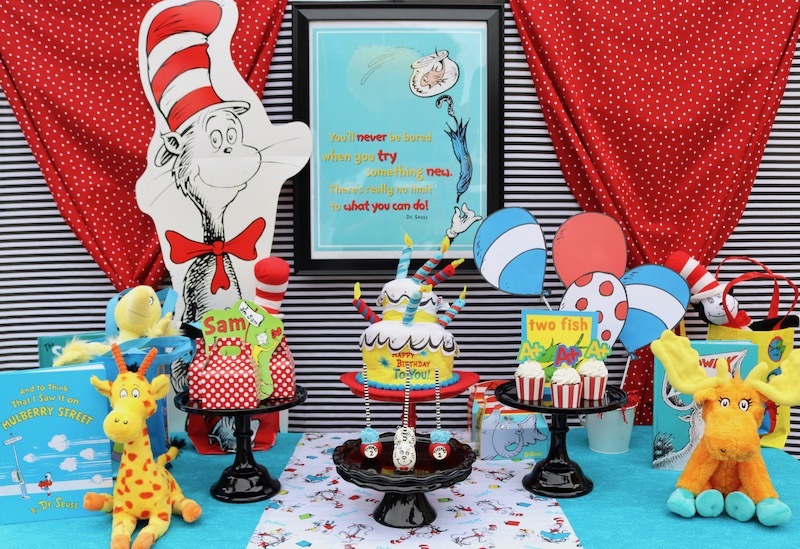 Add Dr. Seuss cutouts in small areas for fun pops of Dr. Seuss-isms! 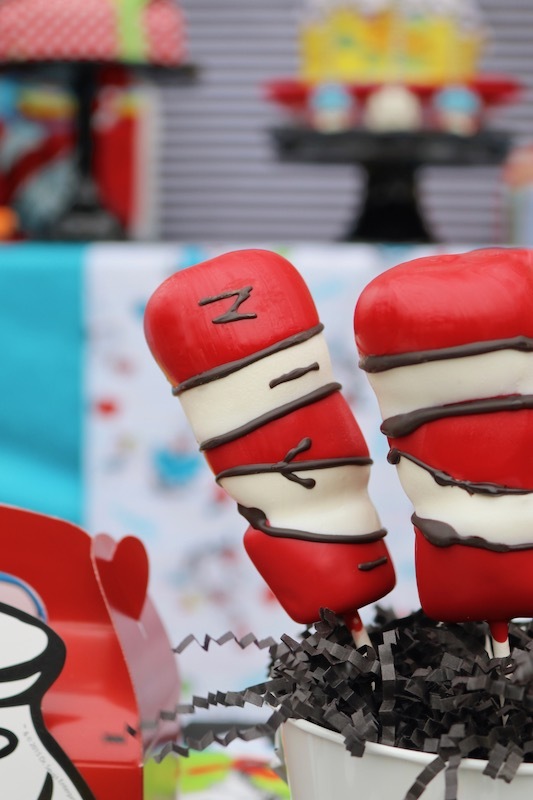 Nicole, from Bella's Bakery, always dishes a super creative spin to all her party treat creations! 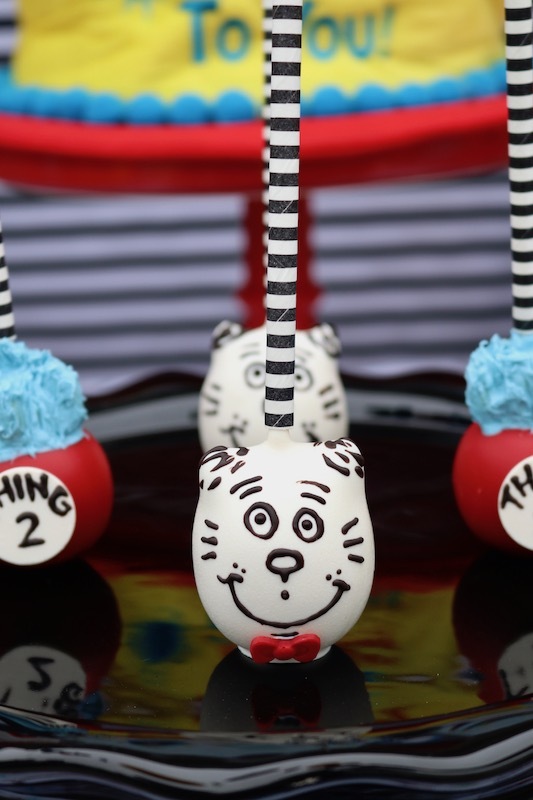 I just love her Cat in the Hat, Thing1 and Thing 2 cake pops! 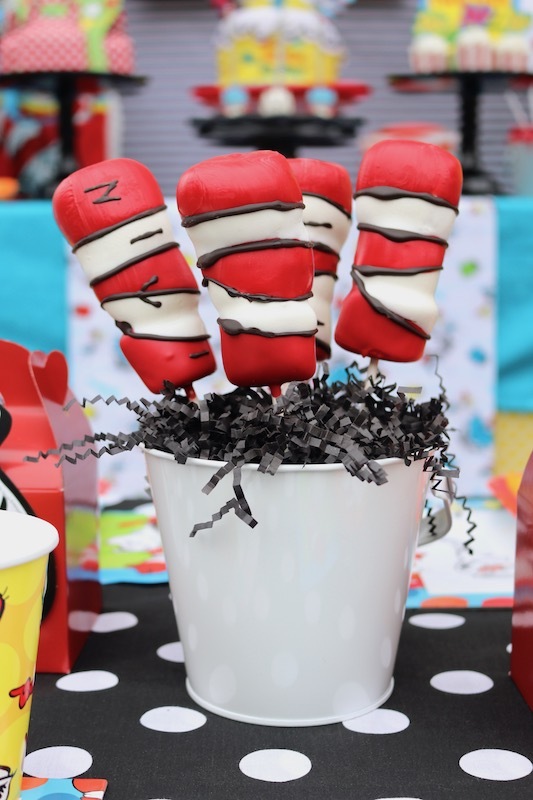 She also whipped up some really cute Cat in the Hat marshmallow kabobs. Yumm! 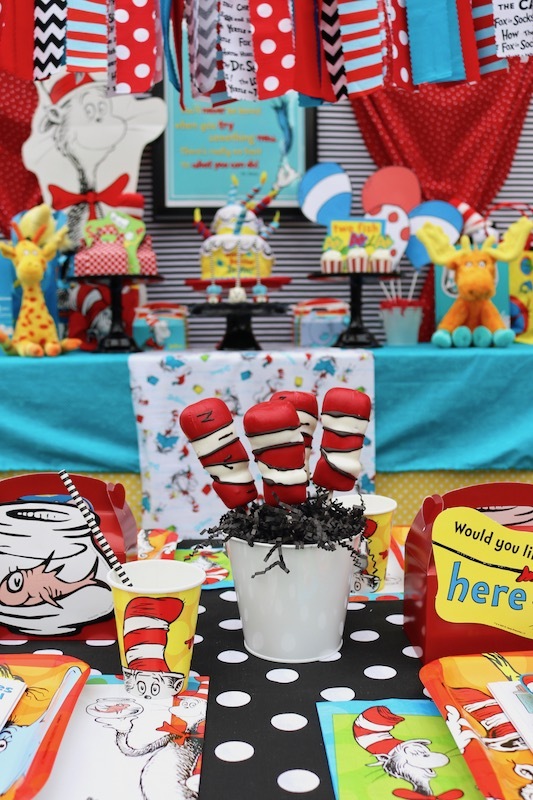 Make your little guests feel special by setting up a separate party table just for them! This can be a small area for them to socialize, read their Dr. Seuss books, and enjoy a few party activities. 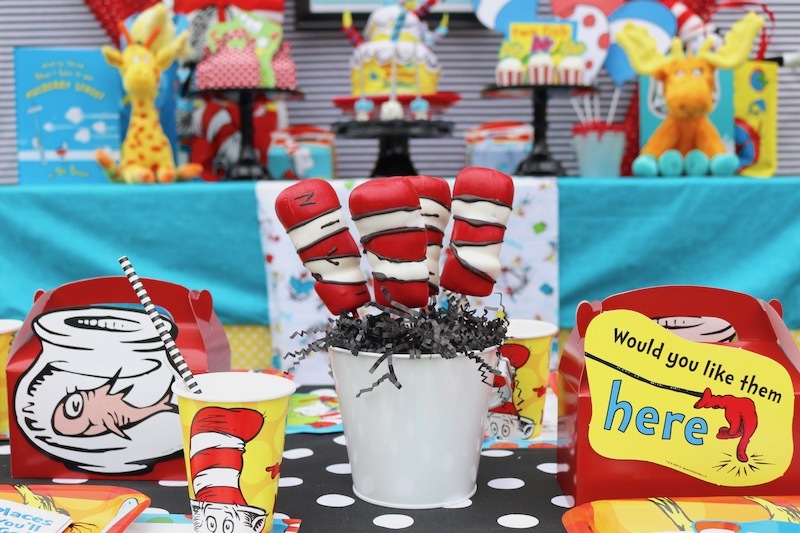 Give their party table a dose of festive decor! 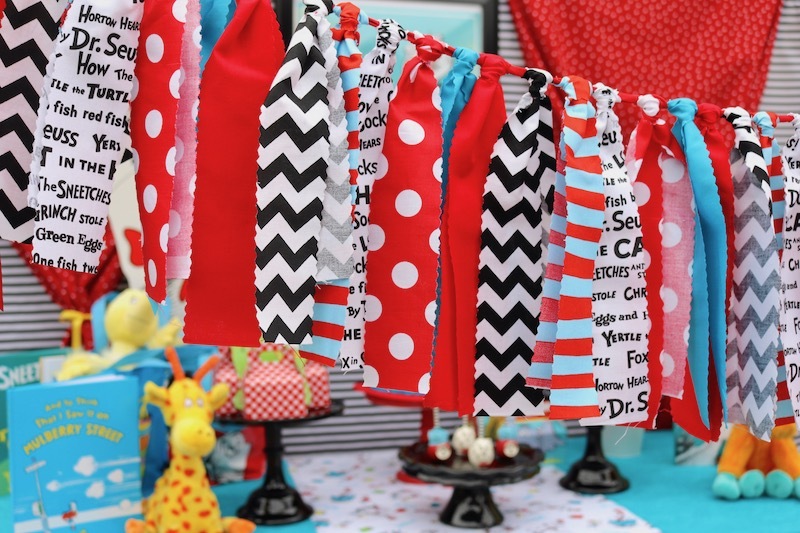 I used a Dr. Seuss themed fabric garland, from The Party Teacher, and suspended it directly above the guests' table. Not only will it provide a fun pop of color, you can also use it later in their special reading corner. 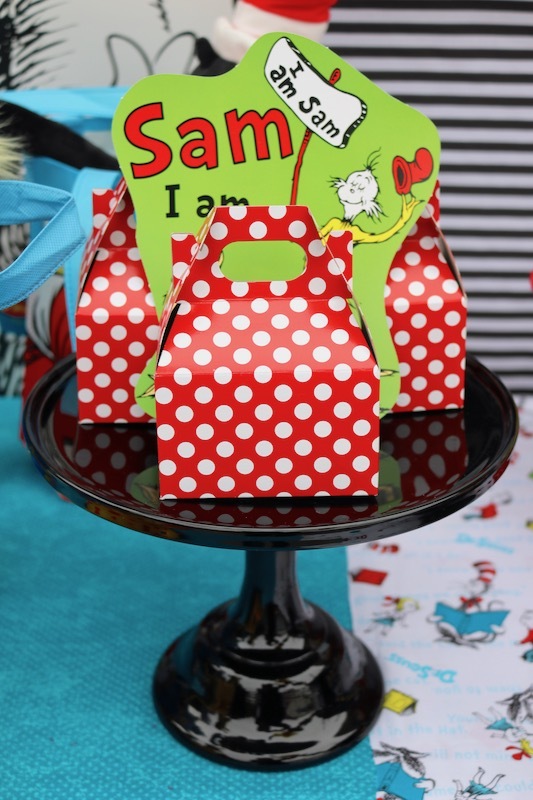 Dress up your red favor boxes by attaching more Dr. Seuss cutouts to the front of them. Get creative with your table setting! 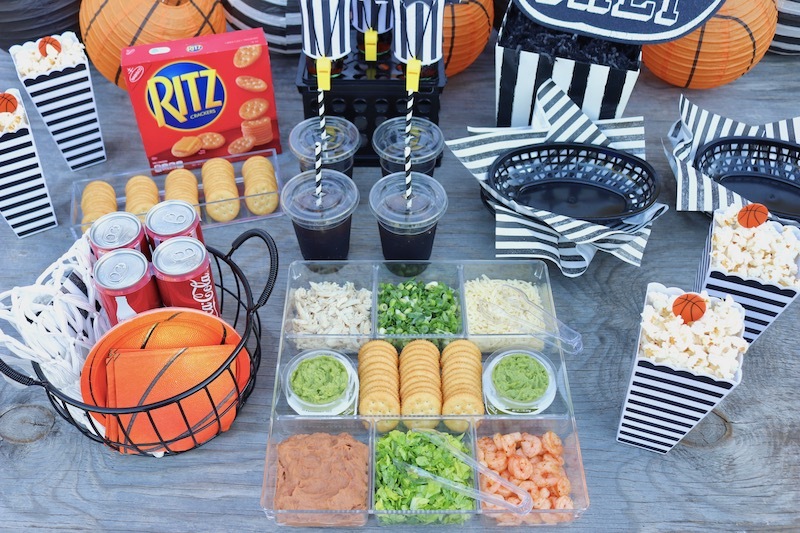 Add some easy activities to keep your party guests entertained. It can be something simple like these little sticker and activity books. 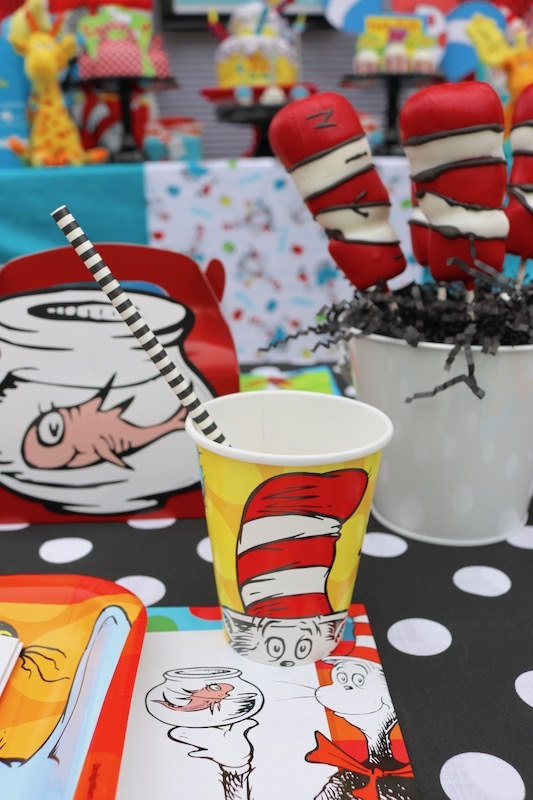 Set them out at each place setting along with Dr. Seuss themed plates, cups, and napkins - all from Party City. 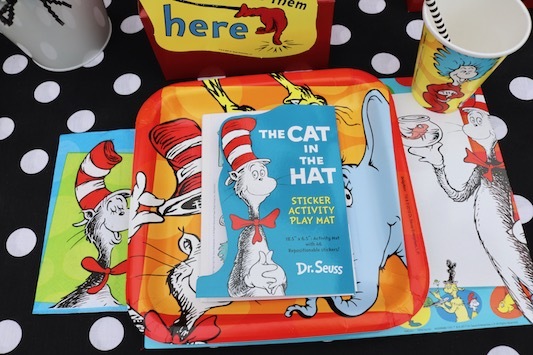 You can also take Dr. Seuss dry erase boards and use them as a placemat - super easy! 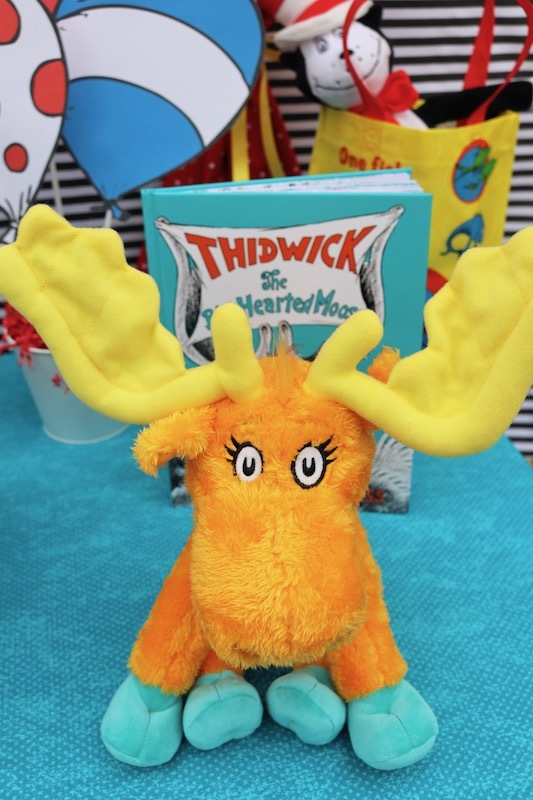 Will you be participating in some fun Read Across America activities and celebrations? Are your younger children excited to get back to school to see their friends? 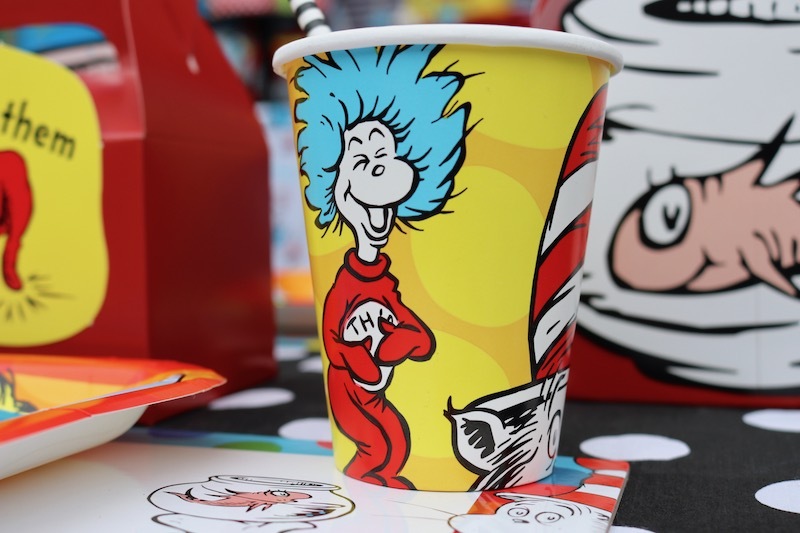 I hope you've been inspired to catch up on some wonderful Dr. Seuss stories!